W x L: 6" x 11"
Compare to Uline S-1530 and Save! Crystal-clear strong 6" x 11" 80 Gauge PVC Shrink Bags resists tampering and protects standard VHS (VCR Video Tapes) from moisture and dust. The cost effective and simple way to to protect your VHS tapes. 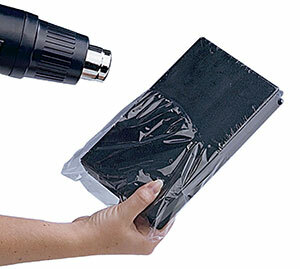 These wholesale 80 Gauge shrink bags are made from PVC film and are flexible, strong and very difficult to tear. Poly vinyl chloride shrink bags have excellent clarity and brilliance, and help by providing a tamper-evident seal for your items. 6 inch x 11 inch PVC shrink bags conform at a lower temperature than other shrink wrap bags made from polyethylene or polyolefin materials.